Interstate 215 is the belt route for Salt Lake City in Utah. Starting at the northern end of the city at its junction with Interstate 15, it closely parallels I-15 south toward Sandy, then turns east and then north to meet Interstate 80. As such, Interstate 215 provides a bypass for both Interstates 15 and 80 while also connecting with Salt Lake City International Airport (SLC). With 1997-July 2001 reconstruction of Interstate 15 and closures of Interstate 80 in 1998 and 1999, Interstate 215 defaulted as the main through route. With completion of those major projects, Interstate 215 returned to its role as an alternate and commuter route. 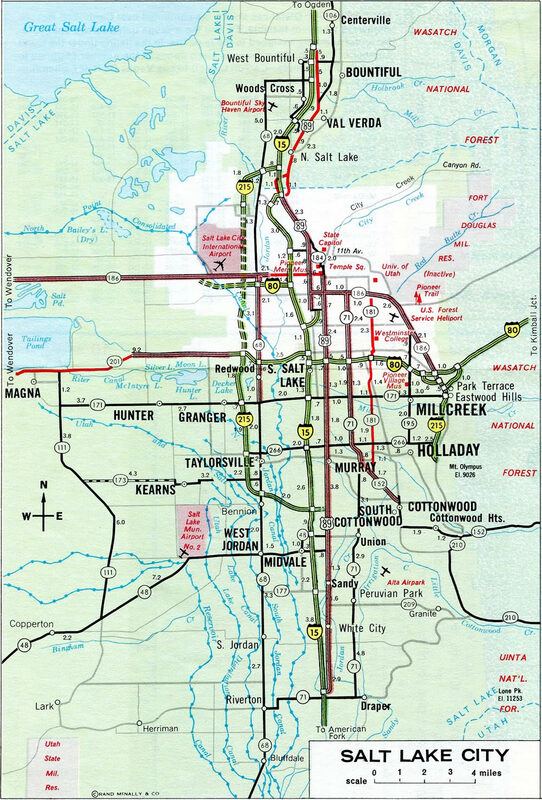 As an effort to maintain continuity to benefit the motoring public, the state of Utah opted to redesignate the entire Salt Lake City Belt Route as just I-215. 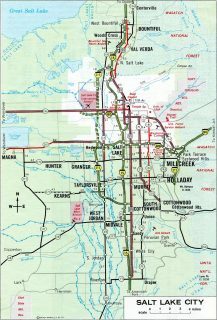 A petition by the Utah State Department of Highways to AASHTO on October 14, 1968 was approved in 1969 to both eliminate I-415 from I-15 in south Murray northeast to I-80 near the mouth of Parleys Canyon and extend I-215 over the same route. 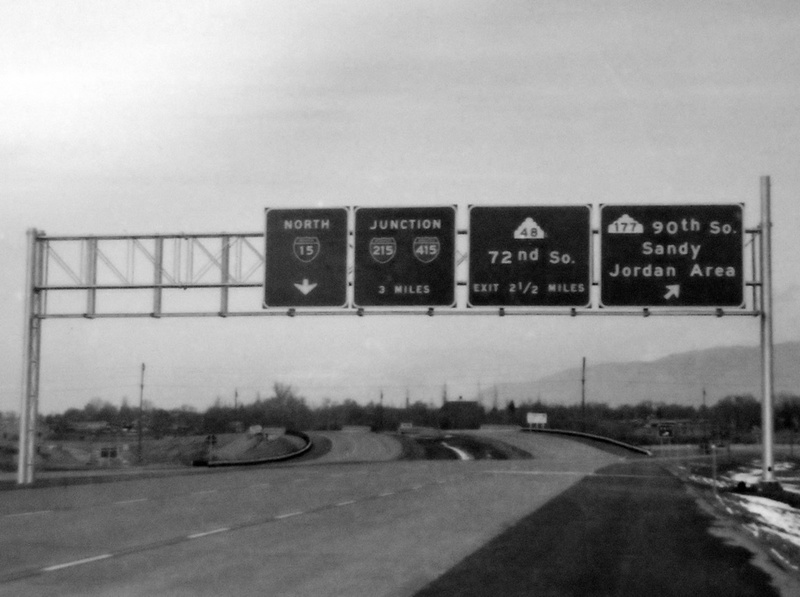 Interstate 415 was indeed signed as this late 1960s photo showed along Interstate 15 north. This photo was found in the Utah State Archives and scanned by AARoads Forum Member CL. A lawsuit was eventually filed by Cottonwood, Inc., but the court did not grant the injunction, allowing work to proceed on completing the route. A closure of the Belt Route from 300 East to 700 East took place on June 4, 1979 in preparation for excavation work. Subsequent construction was divided into five sections.5 Delays however continued through the next decade. 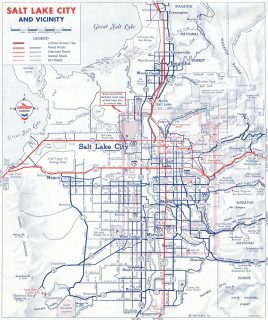 I-215 mostly served local Salt Lake City area traffic in 1978. Salt Lake City in 1978. The western section of I-215 leading north and south of I-80 and the southeast quadrant would remain incomplete for another ten years. The first guide sign for the access road linking Interstate 215 north with I-80 east through Parleys Canyon appears at the 3900 South on-ramp from Holladay. Exit 2 departs in 1.5 miles, while the I-215 mainline extends directly to I-80 west in 2.8 miles. Photo taken 07/08/16. Exit 2 branches northeast from I-215, one half mile north of Utah 171 (Exit 3). Interstate 80 ascends through Parleys Canyon from Salt Lake City to Kimball Junction. The freeway serves eastern bedroom communities located within the Park City area such as Silver Creek Junction. I-80 east also serves the Park City and Deer Valley ski resorts on the eastern slopes of the Wasatch Range. Photo taken 07/08/16. The northeastern prong of I-215 consists of a super-two road from Exit 2 to I-80 over the former alignment of Utah 5. The northwestern prong parallels I-80 west to merge with the freeway directly at the Salt Lake City line. Photo taken 07/08/16. An I-80 trailblazer directs motorists from Exit 2 onto the super two roadway as it winds around the north slopes of Grandeur Peak. Photo taken by Steve Hanudel (05/16/06). Following the super two roadway from Exit 2 to the wye interchange with Interstate 80 east. This configuration is partially due to the lack of space at the mouth of Parleys Canyon. Photo taken by Steve Hanudel (05/16/06). Exit 1 links Interstate 215 north with Utah 186 west (Foothill Drive) and Parleys Way for eastern reaches of Salt Lake City. Utah 186 angles northwest to the University of Utah campus while Parleys Way parallels I-80 west through Sugar House to 2100 South and 2300 East. Photo taken 09/08/05. Traffic from Utah 186 (Foothill Drive) eastbound merges onto Interstate 215 north ahead of its merge with Interstate 80 west. Photo taken 09/08/05. I-215 guide signs for Exit 2 and the connection with I-80 east to Cheyenne, Wyoming were replaced by 2014. Photo taken 09/08/05. I-215 drops below grade beside Wasatch Boulevard and under the SR 171 (3300 South) overpass. Wasatch Boulevard parallels the northbound lanes of Interstate 215 closely between Millcreek Road and a dead end beside Exit 2. Photo taken 09/08/05. Descending rapidly from the high desert of Wyoming and ski resorts of Park City to the flats of Salt Lake City, Interstate 80 winds through Parleys Canyon to enter Salt Lake Valley. A lane drop occurs on the westbound lanes for Exit 130 to the super two roadway linking I-80 with I-215 south at Canyon Rim in 1.25 miles. Photo taken 08/25/14. Signs for the belt route use no control city. 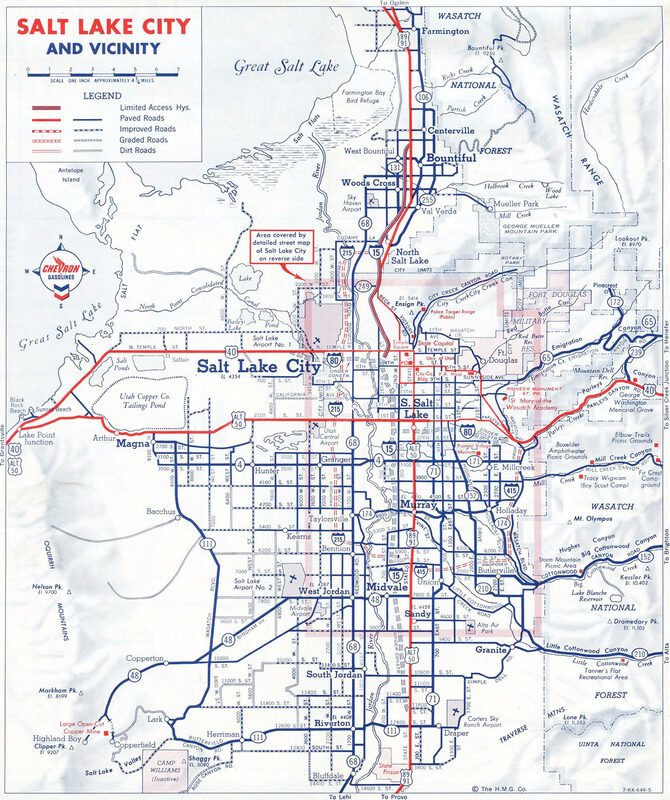 The freeway forms a 270 degree beltway for the city of Salt Lake, with the southeastern quadrant serving the suburbs such of Canyon Rim, Holladay, Cottonwood Heights, Midvale and Murray. Photo taken 08/25/14. The wye interchange (Exit 130) with Interstate 215 is located at the mouth of Parleys Canyon. Photo taken 08/25/14. Exit 130 leaves Interstate 80 west as the freeway exits Parleys Canyon ahead of the Country Club neighborhood of Salt Lake City. Utah 186 (Foothill Drive) spurs north from the ending I-215 nearby to run along former U.S. 40 Alternate toward Downtown. Photo taken 08/25/14. Interstate 80 east traverses a valley fed by Parleys Creek ahead of the wye interchange (Exit 128) with Interstate 215 south. The two freeways parallel one another to SR 186 (Foothill Drive). Photo taken 08/10/16. Two lanes separate from I-80 east for the beginning of Interstate 215. The belt route turns south from Foothill Boulevard to run between the Canyon Rim community and Grandeur Peak. Photo taken 08/10/16. With the mighty Wasatch Range in view, Utah 186 (Foothill Drive) comes to an end as the road splits with ramps for Parleys Way west to the Country Club neighborhood of Salt Lake and Interstate 80. Photo taken by Steve Hanudel (05/16/06). A loop ramp departs SR 186 (Foothill Drive) for I-80 west to Sugar House in Salt Lake and I-80 east to Parleys Canyon and Park City. Photo taken by Steve Hanudel (05/16/06). Foothill Drive contributes two lanes to Interstate 215 south, which also carries incoming lanes from Interstate 80 east. The freeway hugs the foothills of the Wasatch Front until it turns west from the city of Holladay. Photo taken by Steve Hanudel (05/16/06). Interstate 15 enters the city of North Salt Lake at Exit 315 with Utah 93 (2600 South), two miles north of the split with Interstate 215 south. The Salt Lake City belt route provides a bypass for travelers bound for Provo, Las Vegas and other points south. Photo taken 07/08/16. A pair of lanes branch away from I-15 south for Interstate 215 in one mile. I-215 initially leads west to SR 68 (Redwood Road) before it merges with SR 67 (Legacy Parkway) south into Salt Lake County. The belt route continues from there to Salt Lake City International Airport (SLC). Photo taken 07/08/16. Back to back ramps depart Interstate 15 south for I-215 and U.S. 89 (Beck Street). I-215 provides part of a bypass for Interstate 80 west to Wendover, Elko and Reno, Nevada. The belt route returns to I-15 at Exit 298. Photo taken 07/08/16. Extension of the I-15 Express Lanes northward added a sixth southbound lane through North Salt Lake. Work in 2015 included the installation of new signs for U.S. 89 and I-215. Photo taken 09/08/05. Large arrow-per-lane (APL) signs replaced the subsequent set of overheads for the wye interchange (Exit 313) with Interstate 215 south on I-15 south. Photo taken 09/08/05. Interstate 15 leads due south toward Downtown Salt Lake City while I-215 travels by the Westpointe, Jordan Meadows and Glendale neighborhoods of Salt Lake to West Valley City. Photo taken 09/08/05. "Belt Freeway Construction Shows Continued Progress." The Deseret News, February 24, 1968. "Five alternatives for design of I-215." The Deseret News, March 26, 1975. "State endorses I-215 belt route." The Deseret News, December 12, 1975. "Citizen group girds for battle to halt I-215 belt route." The Deseret News, April 22, 1977. "Work begins on segment of belt route." The Deseret News, June 4, 1979. "Belt route – section by section." The Deseret News, July 30, 1987. "Delay in opening I-215 interchange questioned." The Deseret News, September 30, 1988. "105 Miles Planned For Utah&apos;s Interstate." The Deseret News, January 11, 1969. Page updated September 12, 2016.